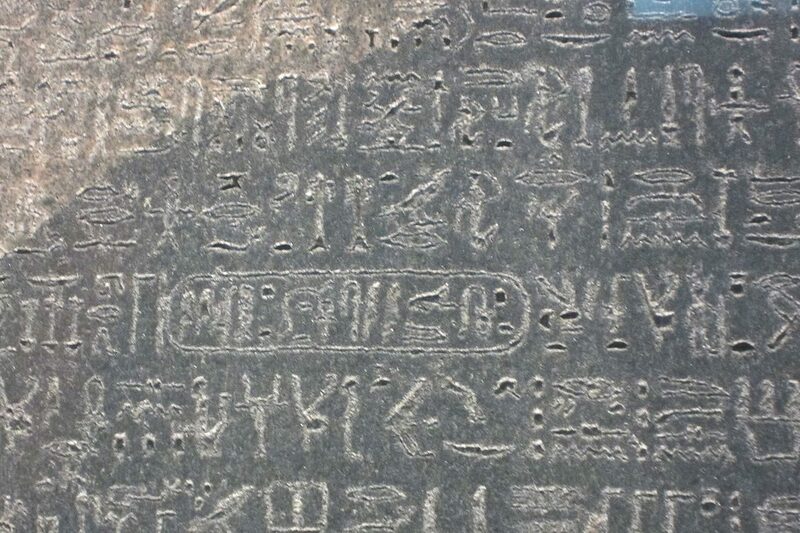 The last time anyone in Egypt wrote anything using hieroglyphs was in approximately AD 400. Yet even well before this date, at the height of the classical age, the writing system was known to virtually no one outside of Egypt. Certainly none of the ancient Greek or Roman authors, stretching back to Herodotus, had any idea how to read it. The Greek historian Diodorus Siculus, writing in the first century BC, could say only that it was “not built up from syllables to express the underlying meaning, but from the appearance of the things drawn and by their metaphorical meanings.” Thus, according to Diodorus, Egyptian hieroglyphs were what linguists refer to as an ideographic or logographic writing system: rather than representing the sounds of a spoken language, as in modern Western writing systems, each glyph stood for a thing, a being, an action, or a concept, as is partially the case in some Asian languages. The inherent drawback of ideographic writing is that it doesn’t scale easily. As new things, beings, actions, and concepts enter the cultural dialog, they must be provided with their own unique, mutually-agreed-upon symbols before anyone can start to refer to them in writing. Proper names — especially foreign proper names — become a particular problem. Modern Japanese, for example, has supplemented its ideograms with other glyphs which represent the sounds of the spoken language. (Not least for this reason, the Japanese writing system is often described as the most complicated in the world.) Today, no purely ideographic writing system is in common use anywhere in the world. The same was true in the 17th, 18th, and 19th centuries, and for a long time before them. This reality must make Egyptian hieroglyphic writing, assuming Diodorus was correct in saying it was purely ideographic, an extreme outlier among the world’s writing systems. And indeed, at first glance one might see no reason to exempt hieroglyphs from the scalability issue. But scholars during the aforementioned centuries, taking their cue from Diodorus, did in fact hold it as an article of faith that the hieroglyphs were purely ideographic. Prominent men of letters like Athanasius Kircher claimed that the ancient Egyptian priests who wrote with hieroglyphs were above the petty concerns of other writing systems — that the hieroglyphs dealt with higher, eternal meanings, and were by their very sacred nature perfect and complete in themselves, being unmoored from the day-to-day concerns of whatever form spoken Egyptian might have taken. The written language used for more plebeian purposes was presumed to be an alternative, apparently alphabetic script that had been dubbed “Demotic” by Herodotus; surviving examples of it too were found from time to time by adventurers and antiquarians in Egypt. It was true that Demotic script was no better understood than hieroglyphs — but then, scholars in pursuit of metaphysical enlightenment, channeling the mystical musings of Hermes Trismegistus, had much less motivation to try to understand it. When a group of Napoleon’s soldiers discovered the Rosetta stone in the Egyptian town of the same name in 1799, many scholars thought their difficulties must be all but over. Its rendering of the same decree from the post-pharonic ruler Ptolemy V in three scripts — hieroglyphic, Demotic, and the well-understood ancient Greek — was a code breaker’s dream. Scholars attacked the better-preserved Demotic part of the stone first, identifying what they believed to be 25 standard letters — tantalizingly close to the 26 of the Latin alphabet. But, try as they might, they couldn’t wrestle the Rosetta Stone’s Demotic text into an exact correspondence with its Greek. Meanwhile it was impossible to make any real headway at all with the hieroglyphic text. Thus ancient Egypt remained a closed book for quite some time after the Rosetta’s Stone discovery, despite scholars from many nations, well aware of the glory that success would bring to them, taking a stab at deciphering it. 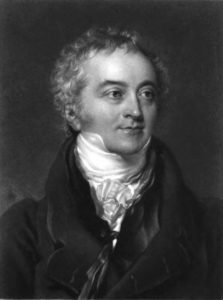 Among them were some of the leading intellectual lights of their day, such as the Briton Thomas Young, an extraordinary polymath by any standard. Born in 1773, Young by the beginning of the 19th century had become one of London’s most sought-after physicians — but he was also much, much more. His many and varied achievements in fields as diverse as medicine, physics, and linguistics would come to include discovering the nature of astigmatism in the eye, establishing the wave theory of light, and grouping many languages together into the historical Indo-European family that is still employed by linguists today. Albert Einstein would later place him on a par with Isaac Newton as one of the most singular minds in history. And in his own time, Young was respected by all as a gentleman of social tact, religious conviction, and undeniable genius. Amidst his countless other intellectual pursuits, he wrestled intermittently with the problem of the Rosetta Stone, although progress there was much slower in coming than in most of his other endeavors. A far less heralded figure was also among those who attempted to crack the code. The Frenchman Jean-François Champollion’s tunnel vision on the topic of ancient Egypt contrasts markedly with Young’s intellectual polyglotism. Nor did social tact or religious conviction number among Champollion’s virtues — but for all that, he was certainly a genius. 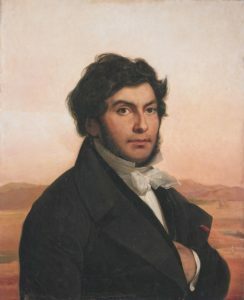 Born in 1790 in the village of Figeac as the son of a provincial bookseller, Champollion was fortunate enough to be sent to Grenoble to study at the age of ten. There his precociousness as a linguist brought him to the attention of Joseph Fourier, one of Napoleon’s savants recently returned from Egypt. Legend has it that Champollion’s destiny was set when he was invited by Fourier to a private viewing of some of the artifacts the latter had brought back with him from Egypt. Hermine Hartleben, Champollion’s first biographer, writes that by the time he left Fourier’s house “he had experienced not only an ardent desire to be able to decipher the writing of ancient Egypt one day, but also the conviction that he would attain this goal.” While there is considerable reason to view this legend with skepticism, we do know that by the time he turned fifteen Champollion was freely telling his elders that “I wish to devote my life to knowledge of ancient Egypt.” He was particularly fascinated with a figure who was little more than a shadowy myth at the time: Ramses II, who according to many Greek and Roman classical sources had been the greatest pharaoh of them all. Throughout his life, he would continue to name Ramses II as his “favorite pharaoh,” the personal hero spurring him on. In 1807, Champollion went to Paris to study in his nation’s most elite circles, thanks largely to the influence of his much older brother, an antiquarian of some note in his own right who was personally acquainted with Napoleon himself. In Paris, the younger Champollion came into contact with more of the returned savants, who were considered at the time to be the world’s foremost authorities on ancient Egypt. Brilliant and well aware of it — he had already mastered at least half a dozen languages — he ruffled more than a few feathers among them when he bluntly announced that he intended to be the one who solved the puzzle of the Rosetta Stone. His tactlessness roused the especial enmity of Edme-François Jomard, who had been struggling with the same puzzle for years without much success. The two men would remain bitter foes until the end. To be fair, Champollion did much to justify Jomard’s opinion of him as an arrogant greenhorn too ignorant to understand just how far in over his head he really was. Not only did he utterly fail to make any headway with the Rosetta Stone, but he embraced and trumpeted all sorts of mistaken conclusions about the ancient Egyptian language in general. He claimed, for example, that there were direct etymological linkages between Egyptian and certain other Mediterranean languages, such as Etruscan, Phoenician, and even ancient Greek. “There’s a conclusion that will really irritate all your dusty scholars of Greek and Latin!” he shouted. Indeed — because it was completely wrong. After two years in Paris, he returned to Grenoble to become a professor at the age of nineteen. He published his first book, Egypt Under the Pharaohs, at the age of twenty. In it, he unaccountably claimed that he had already deciphered the Rosetta Stone, but was keeping the results to himself until he wrote his next book — an outright lie on the face of it. Small wonder that Jomard and so many others scoffed. As a vocal supporter of Napoleon’s regime, Champollion was stripped of his professorship and exiled back to Figeac following the emperor’s final defeat in 1815. There he was forced to move into a room above the family bookshop and employ himself as a schoolteacher to peasant children. Even after he was allowed to return to Grenoble in 1817, Champollion continued to earn his daily bread in this humble way. While Champollion thus toiled in obscurity in Grenoble, the celebrated Thomas Young was in the process of making some major conceptual breakthroughs with the Rosetta Stone at last in London. Scrutinizing the Demotic script on the stone, he noted that some of its letters bore striking similarities to hieroglyphs located at roughly the same place in the text above them. From this he concluded that Demotic writing was not purely alphabetic, as had always been assumed, but rather a mixture of ideographic and alphabetic symbols — i.e., more like modern Japanese than English or French. And that breakthrough wasn’t the only one Young made at this time. It had long been noticed at ancient sites across Egypt that certain hieroglyphs were encircled. The soldiers of Napoleon’s army, seeing the resemblance which the shape of the result had to the cartridges they loaded into their muskets, had dubbed these special hieroglyphs cartouches — French for “cartridges” — and the name had stuck. Earlier scholars had proposed that they might represent the names of pharaohs and other august personages. Expanding on that idea, Young now decided that the circles around these glyphs must indicate a temporary shift from an ideographic to an alphabetic system, used to solve the problem of representing proper names. The six cartouches on the Rosetta Stone, Young concluded, all represented King Ptolemy V, who, as both the issuer and the subject of the ceremonial decree that the three texts constituted, was also mentioned several times in the Greek version. For the first time, Young had advanced the position that neither Demotic nor hieroglyphic writing fell entirely into the category of ideographic or alphabetic; both were to some extent a mixture of the two approaches. But his position with regard to hieroglyphs in particular remained carefully circumscribed; only the cartouches, he believed, were alphabetic. In 1819, he published a preliminary translation of 200 hieroglyphs, both ideographic and alphabetic, taken from the Rosetta Stone and elsewhere. Later scholarship would give him a hit-to-miss ratio of about 40 percent. This may not sound like a very impressive score card at first blush, but it far surpasses that of the likes of Athanasius Kircher. Still, there remained much work to be done. In July of the previous year, Champollion had been driven out of Grenoble by the strongly monarchist city authorities , who accused him of having planted the old Napoleonic tricolor flag at various spots around town. This seeming misfortune proved a blessing in disguise. Unable to steel himself to the intellectual isolation of provincial village life once again, he moved into his brother’s small apartment in Paris. Unable to find work in the capital, he threw his energy once more into the enigma that was the Rosetta Stone and ancient Egyptian writing in general. In Paris, he had access to libraries and universities full of grist for his code-breaking mill, along with — thanks to his state of unemployment — plenty of time on his hands. Working single-mindedly on this one problem for hours, days, weeks, and finally years on end, he gradually revised his incorrect positions and advanced toward the single greatest breakthrough in the history of Egyptology. Champollion published a preliminary grammar of ancient Egyptian one year after his landmark lecture. In it, he noted that the Demotic and hieroglyphic scripts weren’t completely different languages. Nor, needless to say, were hieroglyphs a form of higher, mystical communication transcending ordinary human language. In reality, the two systems of writing were merely different means of encoding the same spoken language. The relationship between them was more akin to that between printed and cursive French than that between French and English (much less French and Japanese!). Would-be historians of ancient Egypt had been groping in the dark ever since Herodotus — the original historian — had visited the country around 440 BC and puzzled over the strange markings he saw all over the Giza Plateau. Now, Champollion turned on the lights. His grammar was incomplete and still riddled with its fair share of errors, but it provided the conceptual framework for reading Egyptian culture in its own words at long last. This was truly Egyptology’s eureka moment. Although his reputation in some scholarly circles was somewhat tainted even in his own time by his unwillingness to acknowledge the contributions of Young, the magnitude of Champollion’s achievement really was indisputable at the end of the day. He immediately became famous across Europe as the cracker of the Egyptian code. Now with no shortage of money or patrons, he traveled widely to scrutinize Egyptian collections outside of Paris, and delighted in lording his newfound status over old detractors such as Jomard. In 1828, Champollion fulfilled a lifelong dream by traveling personally to Egypt. He visited the Giza Plateau in October of that year, as just one of his many stops across the length of the country. In Cairo, he spent some time with Giovanni Caviglia. In fact, there has been some speculation that Champollion may have joined a secret society of Europeans in Cairo, known as the “Brothers of Luxor,” which had Caviglia as one of its more prominent and enthusiastic members. The Brothers were dedicated, in the spirit of a tradition dating back to Hermes Trismegistus, to recovering the mystical wisdom of ancient Egypt. But if Champollion did join them, the act would have been out of character; he showed no other evidence of sharing Caviglia’s metaphysical predilections. His teeth-gnashing over the fact that the temple which Caviglia had uncovered some years before at the front of the Sphinx was once again buried under sand seems much more in character. He knew, from Caviglia himself if not from the stories and descriptions Henry Salt had published in Britain, that three hieroglyph-covered steles had been found there, but he either wasn’t aware of or didn’t trust Salt’s sketches of them. He briefly considered hiring workmen to unbury the Sphinx once again, but gave it up as too difficult and time-consuming. In the end, he was a scholar, not an excavator. This tantalizing key to the extraordinary statue’s origin and purpose must remain buried for the time being. He was more than correct enough in this statement. While later scholarship would show even his latest work to be flawed in many particulars, he had grabbed hold of the essence of ancient Egyptian writing. The rest was just details. It was a changed Champollion who returned to France in December of 1829. At age 39, this Champollion was less abrasive and perhaps wiser than the man who had left. He even began to show a guarded willingness to grant to Thomas Young, who had died while he was in Egypt, some small measure of the credit he had previously denied him. It seems he had been sobered as much by his experiences with contemporary as with ancient Egyptian life; he had had an uncomfortably close view of Muhammad Ali’s oft-brutal regime, including a number of unpleasant but unavoidable personal audiences with the leader himself. Suddenly his admiration for the similarly autocratic Ramses II — not to mention Napoleon — seemed suspect. Unfortunately, he was changed physically as well as mentally by his time in Egypt. His health had never been robust, and he had ruined it by driving himself too hard, trying to collect as much hieroglyphic evidence as possible during the limited time he had at each ancient site. He was satisfied with the result of his labors. “I have amassed enough work for an entire lifetime,” he said. As it happened, though, his remaining lifetime wouldn’t be a long one; his body was slowly withering away from a chronic illness no doctor could identify, much less cure. Aware that his time was quite likely short, Champollion worked frantically to finish a definitive version of his Egyptian grammar. Raising his hand to his head one day very near the end, he cried out plaintively that “there are still so many things inside!” Ironically, his final days bore many similarities to those of his erstwhile enemy Thomas Young, who had spent his own last days working with the same feverish intensity on a Demotic dictionary. Champollion died on March 4, 1832, most likely from one of the many diseases that still made Egypt such a dangerous place for Europeans to visit. His life’s passion had killed him, perhaps in more ways than one. His last words were reportedly “and now for the afterlife, on to Egypt, on to Thebes!” We can only speculate as to whether the committed materialist intended those words in jest or in earnest. His deathbed magnum opus, Egyptian Grammar, or General Principles of the Egyptian Sacred Language as Applied to the Representation of the Spoken Language, was published in 1836. It has gone down in history as the founding text of modern Egyptology, heralding the dawning of a new attitude toward the subject. This new Egyptology would be a quieter, more earnest sort of pursuit than had been the norm until that point. Rough-and-ready explorers like Giovanni Caviglia and Giovanni Belzoni, armed only with enthusiasm, a certain degree of influence, and a measure of Ability in the abstract, had done much to uncover the what of ancient Egypt. Yet the why, the how, and the when remained deeply mysterious. Instead of personal and national glory, the new generation of Egyptologists would be motivated by an honest desire simply to understand this strange but magnificent civilization, so impossibly long-lived and yet so impossibly long-dead. Take, for instance, the fundamental historical question of chronology — the straightforward act of putting definite dates to historical events. Exactly when, to place things in the context of our main interest, had the Pyramids of Giza been built? Through a meticulous analysis of the classical and Biblical sources available to him, John Greaves had concluded circa AD 1640 that Khufu had reigned and built his pyramid around 1266 BC, with Khafre and Menkaure presumably following shortly thereafter. Since Greaves’s time, however, few scholars had dared to put a similarly hard date on things. To do so was to invite not just the ridicule of future scholars but universal condemnation in the here and now. For to move the era of Khufu and his successors further back in time, as even the scant evidence that could be collected before Champollion turned on the lights for Egyptology seemed more and more to indicate was warranted, was to begin to encroach upon the Biblical Flood; this event, according to the widely accepted chronology of the 17th-century Irish theologian James Ussher, had taken place in 2349 BC. With the forces of established religion still being strong in most of Europe — not least in France following the resumption of the traditionalist Bourbon monarchy — setting oneself in direct opposition to Ussher’s literal interpretation of the Bible was a dangerous thing to do. But one thing at least was clear: the line of Egyptian pharaohs stretched far back indeed. Ramses II, whose reign then and now is often considered the absolute peak of Egypt’s power and splendor, already belonged to the distant, shadowy past at the time that Herodotus made his visit to Egypt in approximately 440 BC — and yet Ramses II too could look back to hundreds of pharaohs who had come before him. Champollion would later speculate that Egyptian civilization might date as far back as 5000 BC. But even he, bold and often confrontational as he was, would hesitate to state this belief too loudly in public. Forget the Flood; according to Ussher’s chronology, the world itself dated back only to 4004 BC. Over the course of the half-century that followed Champollion’s death, developments in any number of areas, from dinosaur fossils to the theory of evolution, would finally make such literal readings of the Bible as Ussher’s clearly, undeniably untenable within scientific and historical circles. In a sense, then, he was born just a little bit too early. Still, the example of his willingness to read Egyptian history on its own terms, without recourse to the Bible or to mysticism, was in its way as significant a contribution as the raw ability he provided to read hieroglyphs at all. In this sense, perhaps even more so than in the other, he earned his title of father of modern Egyptology. And yet changings of the guard seldom happen all at once. The year after Champollion’s magnum opus was published, one last specimen of the earlier breed of Egyptian antiquities hunter took up residence on the Giza Plateau to ring out the old era with a bang. A literal bang — his preferred means of excavation was gunpowder. Compared to Colonel Richard William Howard Vyse, Caviglia and Belzoni were downright subtle. 16 Comments for "Chapter 7: The Polymath and the Specialist"
I can tell we’ve been reading the same books. I’m enjoying this series, although I’m afraid I don’t have anything substantive to add about the current topic. Now, I got here from reading your other wonderful blog (Filfre). The concern for me is, are you getting enough readership for this blog? The comments section in most of these articles is usually very thin, compared to that of your Digital counterpart. Building a readership is a slow process, and I was prepared for that. Overall, the current state of things is neither the best nor the worst possible situation I imagined for this stage when I launched the process. I don’t think you’re alone among readers in just “not having anything substantive to add.” There are a lot of things that drive commenting on the other blog that don’t apply here. When I write about a game with which people have some personal connection, they want to share their own impressions and anecdotes — which is great, of course. But the same dynamic just isn’t really in play here. While life’s too short to spend much time in Google Analytics and the like, I do know that the popularity of any given article isn’t always reflected by the number of comments it receives. That said, there’s undoubtedly a much smaller absolute number of readers here as well. There’s a whole infrastructure of computer-game news sites and the like that drives traffic to The Digital Antiqurian. While I’ve never written for that readership, my hope has always been that a small percentage of such drive-by readers will get interested enough to stick around, and that hope’s generally been justified. But there just isn’t a similar network of general-history sites driving traffic to this one and pushing up its Google rankings. In the long run, this material may be best suited for publication in book form. I feel like there’s a market for a “Wonders of the World” line of well-written ebooks tackling these fascinating topics in accessible and narratively compelling ways. At any rate, I’m committed to finishing this series, getting it published as an ebook, and then doing a second series on The Oracle of Delphi. If uptake is still thin at that point, I’ll have to make a hard decision — hard because I find this work immensely rewarding and feel subjectively that the end result is some of the best writing I’ve ever done. But it’s still early days, and I still have high hopes I can make it work. I am enjoying this too but as you said I have nothing to contribute. Only that when I visited Egypt I was more impressed by the desert itself and the terrible heat than the pyramids or the temples. Not that they were not great but the desert and the sun… oh man. And also how one temple had Muslim paintings over Christian paintings over ancient Egyptian paintings on a wall. That was History rIght there staring silently to your face. Unfortunately I don’t remember where it was. Yes, I’ve been trying to capture some of that tangible *flavor* of Egypt as an embodied place rather than make this strictly an intellectual history. The Japanese ideograms are derived from the Chinese characters. And Chinese doesn’t supplement it’s characters to this day with glyphs that represent spoken language sounds. And yes, foreign names are butchered in Chinese. Martin becomes 马丁, spoken ma ding. The first sign translates to horse and the second to the common family name Ding. Check it out on Google Translate, the common Western first names are all ‘translated’. As I understand all this, it *is* true that “no purely ideographic writing system is in common use anywhere in the world.” But it apparently is not true — assuming Chinese doesn’t use Latin characters — that *all* ideogram-rooted languages have introduced *other glyphs* to represent things phonetically; Chinese, it seems, has repurposed the same glyphs. I’ll clean that up. Thanks! As far as I know no they don’t. My girlfriend is Chinese and if I want to talk about some western actor, scientist or whatever first I have to try to explain who is it because they change their names as explained by Metz above. Even considering that she has been living in Europe for many years and is therefore more acquainted with western culture that her family back in China. For example they always write my name with Chinese characters, not Latin ones. >> his preferred means of excavation was gunpowder. Compared to Colonel Richard William Howard Vyse, Caviglia and Belzoni were downright subtle. I await Chapter 8, with glee, and bated breath. RWHV: A Complete Idiot with Access to Explosives, who happened to discover something amazing in the construction of the Great Pyramid, but didya rilly havta use Dynamite? Thanks for a truly engrossing read. As you can see, I literally devoured every letter of it! I don’t know of any signs to indicate that a character is reduced to phonetic value. Maybe they did this in the past. I see it always determined by context. But I am no Sinologist, just married to a Chinese woman and struggling with that language for three years.. The Chinese use Latin characters for brand names like BMW or when they name an international company like Huawei. The names of people are never spelled in Latin characters. And as Laertes writes, the names even sound very different because of this.